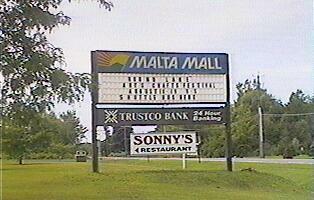 The malta mall is owned, operated, and built by the Van Patten corporation, operating as "Country Club Acres". Van Patten built all the neighborhoods of Clifton Park and Malta, including the malta mall. The Northway 11 apartments were built primatily to support the Navy servicemen and their families who were temporarily stationed at the training facility in Milton. 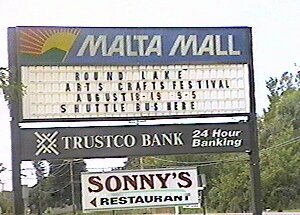 The original tenants of the malta mall were as follows: Grand Union, Norstar Bank, True Value, Fay's Drugs, Paesano's Pizza, Joe's Liqour, The Video Escape, a hair salon, and small usps booth. The Grand Union was small and dirty. The hardware store was overpriced but had pretty much what you needed. The video store was mom and pop and failed when dvds came out. The bank and joe's liqour are the only remaining original tenants. The Paesano's went through numerous transitions and is now a sonny's italian restaurant which took over the usps booth as a dining room. 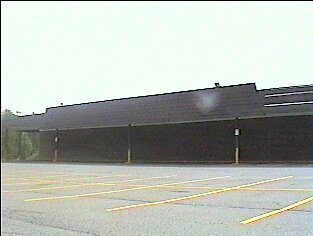 In 2011, the mall is going to be torn down to make way for a new hannaford with additional retail space. The Malta Mall doesn't even qualify under the categorization of a mall. It is a single story, rectangular shaped building that runs from end to end with a few storefronts lining the north and south walls, and the single narrow hallway that was never very crowded running east and west. When I moved in, oh, somewhere around 1989-90'ish or so, the Mall had just a Grand Union and a Fleet Bank (it wasn't called Fleet Bank back then, it was called "Norstar Bank", and eventually changed it's name to "Bank of America" late last year under new ownership) for what passed as anchors. The parking lot was built much too big for the Plaza itself, with way too many spaces than needed (the traffic it got was primarily from just the Northway 11 apartments and the Housing Complex downhill of it - it got some from the retirement community as well) and you were lucky to see more than six cars in the lot at any given time. The lot featured old, burned-out in some cases block lights on poles that barely gave off enough light to let you get your key in your car door, and the pavement itself was a mess, pockmarked and covered in gravel and stones at all times, with weeds sprouting up here and there as well. The paint on the lot was faded into a dull puke-yellow, and the black pavement looked more ashen than black. 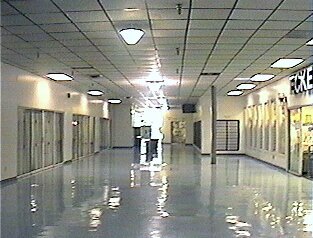 If you went inside (only the video store had an inside-only entrance to it) you left as quickly as you came, as soon as you could, and you likely didn't see another person outside of your own party walking the halls. Everyone entered the stores from the outside and pretty much they went into the one business they came there for, and then went home - they didn't go to the other businesses and move between stores or anything like a real mall gets. If they came for the bank, they went home after doing their business at the bank. If they were there to rent a video, they went home after getting their video. It was pathetic, really. 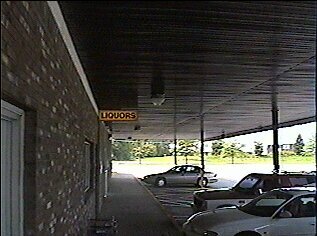 The grounds are unkempt, and a mess, never were cared for properly in my memory, and by the time I moved out of the area, all that was left in there was the grocery store (filthy) and the pizza place (rude as ever). The bank had closed down, the rest of the businesses went with it pretty much except for the drug store. 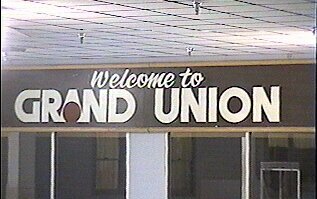 The Grand Union closed down a few years later when the chain went belly-up, and the drugstore soon followed after it lost the grocery store. The pizza place hung in tight for as long as it could, but eventually the family that ran it either went out of business or found a better location. I'm not sure which. 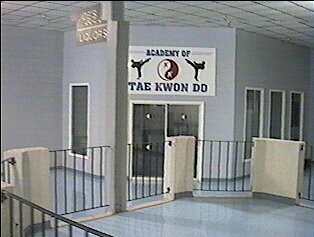 A few years later a Tae Kwon Do place moved in, followed a couple of years after that by the mailboxes (needed for the Northway 11 apartments which had outgrown their own mailbox stands and needed more) and then eventually the little church that's in there now. I haven't been there in a few years, and I've no motivation to go looking at it now. 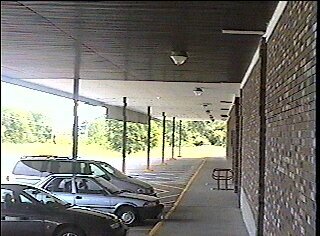 It was always a dump, it was always a dead-zone in the middle of the suburban ghettos (that's what we called the Northway 11 Apartments) and the elementary school, and more than a few muggings and knife fights broke out after-hours when everything was closed in the parking lot. I do not have an pictures of it (and honestly the ones in the other submission are more than sufficient - the place doesn't even warrant that many) and I don't plan on taking any of it anytime soon, unless it's to go see the rubble left after the wrecking ball is done. The place is bound to be torn down eventually. Hopefully they'll put something USEFUL on the property instead when they do. If they don't, they'll probably just build more cookie-cutter apartments on it anyway. 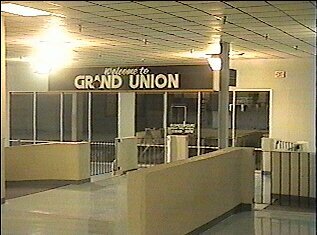 Either way, unlike the Mohawk Mall which at least had an aesthetically pleasing environment inside, the Grand Union Plaza won't be a loss to anyone when it's finally demolished, and it might just be a relief. To call this a mall is being very generous. 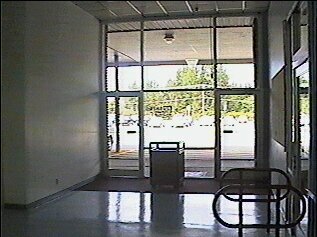 All it is is a small shopping plaza with a hallway that runs behind it. It originally housed the area's main supermarket, Grand Union, at the eastern end of the mall which is now empty, a Fay's drugs, now Eckerd, which still exists in the middle. 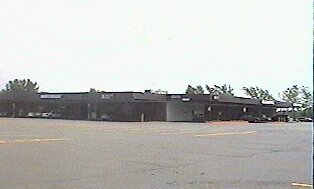 A few smaller stores still remain which include a liquor store, Trustco Bank, a diner, and a nail salon. 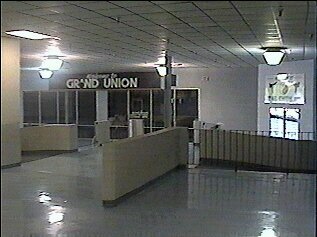 I don't really know the history of the mall, but I know it was the Grand Union that kept it alive. 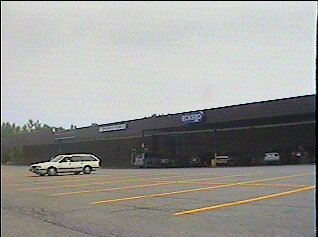 In the mid 90's the chain closed down many of its older stores including this one. A newer store was built on the other side of Malta. Grand Union ultimately went out, that new store is now a Price Chopper. 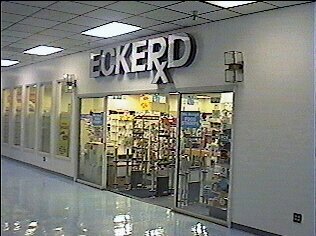 Eckerd is now the mall's largest store. I would imagine that the mall section (the hallway) was never very busy due to its small size. 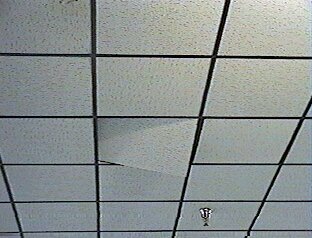 My dad says that at one time there was a Hallmark card store in the back section of the mall. That space is now occupied by some kind of private church. 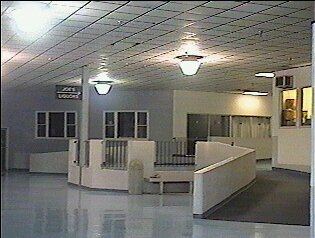 I also remember an arcade that once occupied some of that space. 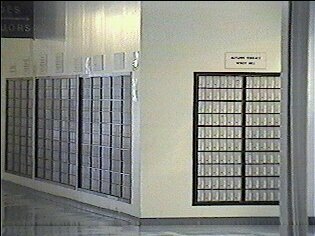 The mall now also houses several mailbox's for nearby apartment complexes. I've never seen that arrangement in a mall before. Maybe they got the word "mall" confused with the word "mail". 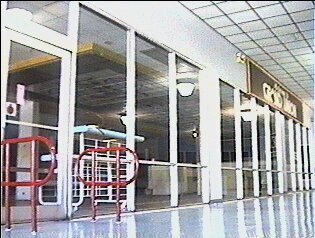 The outside of the mall is not kept in very good condition these days, as you can see in the pictures. I would imagine that eventually the mall will be torn down and the remaining businesses will move elsewhere.